SKYNET - A Solution to Drones! You are here: Home / SHOT Show 2016 / SKYNET – A Solution to Drones! SKYNET – A Solution to Drones! Advanced Ballistic Concepts announced their innovative new SKYNET anti-drone round at SHOT Show this year. This is not the SKYNET made infamous by the Terminator movie series, though I believe the naming is more than by chance. The new round is a collaboration of the company’s SKYNET and Center-Shot Technology, and is designed to down a drone that could be interfering with police investigations, or simply trespassing and spying on public or private property. The introduction to fairly inexpensive drones has become an internet craze, with many individuals purchasing the devices for a wide range of activities. There are some incredible videos of sports activities, stunts, animals, and other outdoor activities that could not be achieved without an aerial platform. Unfortunately, the FAA has been wishy-washy about the limitations of using a drone over private property (that includes public institutions like police departments). The Advanced Ballistics Concepts SKYNET projectiles are designed to defeat the threat of privacy invasion by unwanted drones. 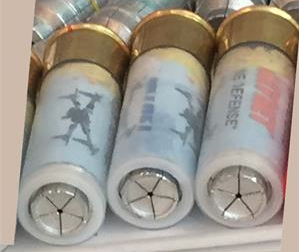 The company has produced 12-gauge shotgun rounds for law enforcement and civilians to use against unwanted aerial intruders. 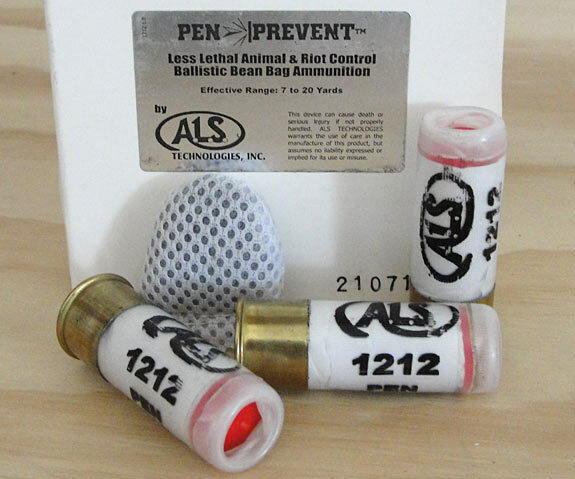 For law enforcement only, the company also provides a 40mm launch able round with a greater expanded radius. SKYNET 12-guage rounds are 2.75″ chamber and expand to 6-feet in diameter. The design concept of SKYNET is to load a fairly standard 12-gauge shotgun round, that is loaded with the SKYNET cartridge. As the round is launched from the shell and leaves the barrel, the round is designed to stay intact for a brief time to allow for more accurate delivery. A short time into flight the round separates into tethered parts. As these parts separate and extend outward, a form of web is created. When the expanded the SKYNET round creates a fairly wide capture pattern. When the SKYNET round reaches the drone the tethers and round pieces wrap around the drone, interfering with the propellers and forcing the drone to the ground. If the SKYNET round misses the target it is designed to parachute safely to the ground to reduce any unwanted damage or injury. Less lethal “bean bag” rounds can be used, but provide much less accuracy and have a greater injury or damage potential. Traditionally law enforcement was very limited in the measures that could be taken to counter drone surveillance used against them. Firing weapons at a drone may be an option, but one that is extremely limited due to safety considerations for anyone in the immediate area. What goes up must come down, so simply firing at a drone is not always an option. Firing less lethal projectiles may be an option, but with greater accuracy requirements and higher injury or damage potential. 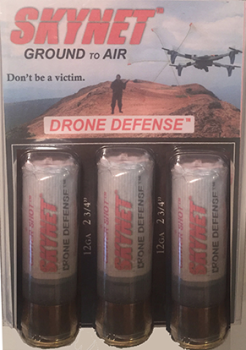 SKYNET drone defense rounds. They’re not cheap, but defeating drones may be worth the cost. designed to parachute back to earth on missed shots. Movies like Eagle Eye, and Iron Man II popularized the use of military drones in fictional thrillers. What was once a highly kept national secret is now a well-known tactical asset. My Department’s Public Information Officer (PIO) has always enjoyed remote controlled aircraft and used to fly a mini-helicopter around our atrium at night or on weekends. When drones came on the market he bought one for around $400. Most of us just laughed at his boyish hobby, but when he attached a Go-Pro camera and started showing us the pictures and videos he was making, our perceptions changed immediately. Aerial videos of our police station were amazingly clear, and it was really cool to watch. Still pictures could be made from the videos as well. However, then we thought about what it would mean for anti-police media, civilians, or criminal groups to use a drone for nefarious reasons against cops! 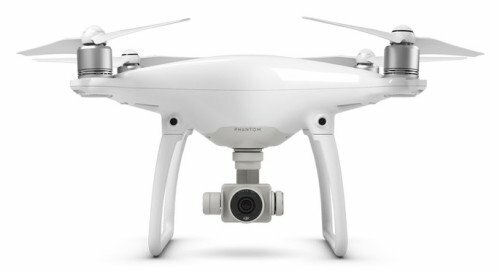 The DJI Phantom 4 is one of the more advanced civilian drones on the market and carries a $1499 pice tag (photo by DJI). The SKYNET rounds appear to be a great solution to a growing concern for law enforcement and private entities alike. What goes from being a hobby to an invasion of privacy has not been clearly defined in law for drone use. However, I firmly believe that the vast majority of Americans would feel violated if a drone was flying over their backyard, or over the street, and videoing into their house or other private areas. Just because the drone is not physically touching property, most Americans expect to be free from intrusion in the airspace around their private areas. I believe drones are here to stay. I see a very valid use for them in law enforcement, and private use. However, I think that law enforcement officers and agencies should retain some privacy in certain matters, and laws should allow the prohibition of drone use around law enforcement properties and actions in some regards. At the same time, I believe private use of drones should be protected, as long as the flight and any recordings or transmissions do not violate other’s privacy rights. The SKYNET rounds appear to be viable anti-drone counter-measures that law enforcement should consider having on hand during major events and critical incidents. Muller Choke tubes are designed to be the best shotgun choke tubes in the world. As a Master shooter (Sporting Clays/FITASC) and an aerospace manufacturing professional, Jimmy Muller, has revolutionized shooting sports through his cutting-edge design and precision manufacturing. Take heed propeller-heads… I don’t care if it’s a federal offense to shoot one out of the sky or not… If you’re flying it over my private property and invading my privacy with it then you can expect for it not to return… And by the way… I’ve shot down three (3) of them in the last nine (9) months over my property… Law enforcement’s only comment… To the drone owner, NOT to me… What were you doing hovering it outside his window with a video camera in the first place… So federal law or not… Having a law in place and having it enforced are two VERY different things… My experience is that law enforcement usually sides with the property owner and NOT the drone operator… Because the drone operators are as big a pain in the a$$ to law enforcement as they are to the property owners… Do you know how many nuisance calls law enforcement gets about these things (drones)??? I think they’d probably pop off a few rounds at these things too if they could get away with it… LOL! Good for you for protecting your privacy. If someone is quoting some arbitrary Federal law I’d like to know exactly what statute they are referring to. From my research, the FAA generally uses a 400-foot ceiling above ground level as the beginning of air space where aircraft fall under FAA rules. However, these small unmanned drones are still very much in a gray area so any protections a drone operator may feel they have, even above 400-feet, is likely non-existent right now. Hovering outside your window, Really ?